It's been nearly four months since the Samsung Galaxy Nexus arrived, bearing the latest version of Google's mobile OS, known to most of us as Android 4.0 or Ice Cream Sandwich. In this span of time, only a handful of smartphones and tablets have been blessed with an upgrade to this iteration. Why? One word: differentiation. The majority of mobile manufacturers are determined to come up with their own brands and tweak the open-source OS to their whimsy as a means of standing out from the rest of the crowd. But doing so involves several months of designing, programming and testing -- for each individual device. Sadly, this means we're left waiting impatiently for most outfits to come out with their own customized skin. Since the latest iteration of Android meant a considerable adjustment to the OS' design -- as well as an endless list of new features, bug fixes and other improvements -- the lengthy wait has left us only able to speculate and theorize what types of adjustments HTC will make to its own adaptation of Android's user interface, nicknamed Sense. 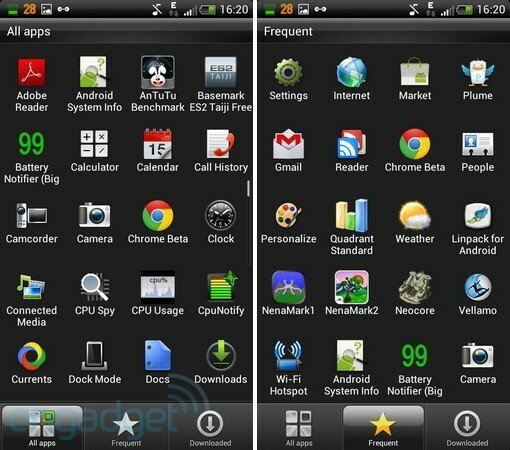 What's more, it was recently revealed that there would actually be not one but two versions of the UI running on ICS: Sense 4.0, the skin of choice for the One lineup, and 3.6, the option for whichever legacy HTC devices are lucky enough to be on the upgrade list. Even though both run Android 4.0, the two builds look drastically different. We only had a very limited amount of time to spend with the former at MWC, but we were given the opportunity to experience the latter on a Sensation XE. Now we can finally have our questions answered at long last: how will HTC integrate ICS into its Sense UI? How different will it look and feel? What features will the company dish up or throw in the trash? Uncover the mysteries with us as we offer an extensive preview of Sense 3.6 after the break. Before we upgraded our Sensation XE to Sense 3.6, we were expecting to see something not unlike what's loaded on the One X and One S, both of which sport 4.0. Our assumption was based on the fact that HTC has recently focused on making Sense simpler, and we found ourselves wondering why HTC would bother cranking out two ICS-optimized versions of its skin that ultimately stand in complete opposition to one another. Yet that's exactly what happened: Sense 4.0 is the lighter and simpler UI, while Sense 3.6 looks a lot more like the old-school 3.0. This undeniably leads to further fragmentation of Sense, and it's not likely to get better anytime soon. Both versions were developed in parallel to each other, which gave us even more reason to initially believe the two would be closer in look and features than they actually were. So what gives? According to HTC, there are a couple reasons: first, users of legacy devices are accustomed to the previous interface, and the upgrade adds the features and benefits of ICS without upsetting that user experience. 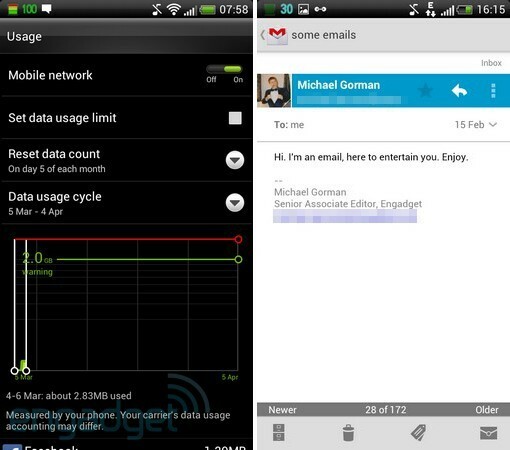 Second, only the One lineup can support ImageSense, which is an integral part of Sense 4.0. Whether you agree with the reasoning or not, this undeniably leads to further fragmentation of Sense -- something we've already seen to a lesser extent with 3.0 and 3.5 -- and it's not likely to get better anytime soon. Not only does this firmware look an awful lot like the version you just upgraded from, there's an interesting clash between the old user experience of Sense and the new UI design of ICS that may throw you off a bit. Essentially, Sense is suffering from an identity crisis, as if it's attempting to reconcile its future with its past. If you've played with stock Android 4.0, you'll notice that elements of the two interfaces are paired together inconsistently throughout the firmware. Imagine for a moment that you're ready to paint your bedroom but can't decide between two colors, so you throw both onto the wall. That's Sense 3.6. Stepping off our soapbox, let's dive into what's new. The unmistakable clock and weather widget, a staple on HTC devices dating back to Windows Mobile, hasn't gone anywhere in 3.6. But guess what has: the launch bar at the bottom of the screen. What was once a large eyesore that gave the phone option way too much real estate, leaving barely enough room for the app menu and that unnecessary personalize button, has been completely transformed. The menu button is now smack-dab in the middle, flanked by up to two shortcuts on either side. As with stock Android 4.0, the options here are completely customizable, and you don't have to use up all four slots if you don't want to. Additionally, folders can be used as an option. 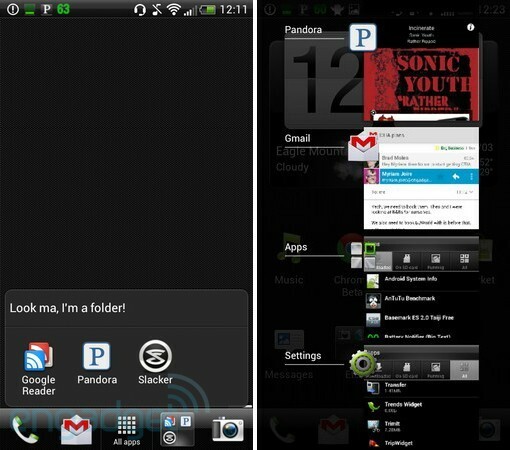 Which reminds us, ICS' new folders can be added anywhere on the main screen, even though they have a Sense-ized look. 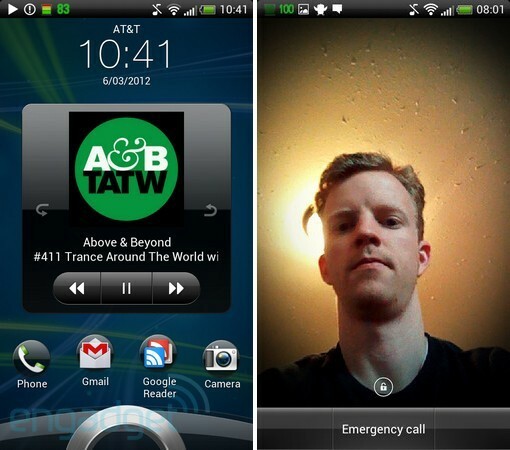 HTC keeps the ICS multitasking setup, easily accessible by long-pressing the home button. The task killer is also available here by swiping the listed app to the left or right. When in the main home panel, a single tap of the home button will let you view (and quick jump to) any of the screens on the carousel. Yes, the love-or-hate 3D carousel is still here, a "feature" that won't be sticking around in 4.0. In fact, most 3.x animations haven't gone anywhere. Fortunately, panels can be added and deleted here, something that wasn't possible on 3.0. Lastly, long-pressing the panel offers the usual Sense personalization options, and not just an option to change the wallpaper. Three different categories are tucked behind tabs lining the bottom of the screen. Pulling down the notification menu will reward you with nearly the same setup as you'll find in 3.0. It still has that dual-tab at the bottom, with notifications on the left and quick settings to the right. The quick settings tab offers the usual suite of WiFi, Bluetooth, Airplane Mode and Mobile Network toggles, and adds a button that'll let you select which specific WiFi hotspot you want to connect to. Some individual notifications now have small thumbnails, and most notifications can be swiped away a la ICS (excepting some that apply to the entire system), but you can't get at the official settings menu from here. Another refreshing feature brought over with Android 4.0 is access to the notification menu directly from the lock screen. At first glance you'll see nothing new. 3.6 offers the same ring at the bottom, with the standard four quick access shortcuts and date / time on the top. Most of its changes, however, are more than just skin deep. HTC retains the Face Unlock functionality in this version, for instance, and the shortcuts are also swappable -- a feature that wasn't available until 3.5. There's a caveat here, though: the only way you can switch the apps is to put them in the launch bar, a stark contrast to 3.5, wherein you can change them to whatever you want through the personalization menu. And when you store folders in this section, the associated quick access shortcut will take you directly into the actual folder itself. As you may recall from our review of stock Ice Cream Sandwich, the new version of Android aims to rid your device of the need for any type of physical or capacitive navigation buttons by adding three virtual ones at the absolute bottom of the display. Naturally, this doesn't do legacy phones or tablets a lick of good. In order to take advantage of the hardware the older devices have, HTC has blessed its keys with the same exact functionality as before. The capacitive menu button takes on its identical role, instead of the standard ICS version that shows up on different parts of the screen, depending on what you're doing. The only variation to the menus is in the ICS-style design. Home, back and search perform no different on 3.6 either. Ah, the app menu. A refreshing design choice in stock ICS, but the same old story in Sense 3.6. You still swipe up and down through the grid, instead of left to right, and there are no widget or shortcut screens present -- those are still only accessed from the personalize menu. The three tabs (all apps, frequent and downloaded) still sit at the bottom, although they're spaced out evenly across the width of the screen. Even the menu button options are identical. The Sense dialpad hasn't changed and there aren't any new features, but the app's seen some minor reshuffling nonetheless. Four tabs grace the bottom of the screen below the keypad: phone, people, groups and call history. The latter three options were here before, bundled together in the contacts app, and could be accessed from the dialpad; now, however, they all reside within the same app, making for a much more coherent arrangement. Aside from this move, HTC's made a few tiny tweaks here and there to reflect the ICS design. Sense 3.6 offers a slight design tweak to HTC's default browser, but it's not extreme by any measure. The URL bar remains on top, with the refresh button sitting on the right. New to the team, however, is the dedicated back button on the left -- a much more convenient location than in 3.0, where it was resigned to the options menu. The whole ensemble proudly resembles the ICS design scheme. You're treated to nearly the same suite of settings, but the "view desktop site" toggle switch has found a home here. Unfortunately, the experimental ring-style navigation menu that we enjoyed in stock Android 4.0 was shunned by HTC this time around. And for the diehards who are curious, Chrome is indeed available in this version of Sense, so knock yourselves out. Anyone faithful to HTC because of its marriage to Beats won't find anything new to rave about with 3.6. Sadly, system-wide Beats integration -- the option to use it when playing third party apps -- is nowhere to be seen here. HTC told us this is due to a deeper recoding of the audio system as part of Sense 4.0, so Beats enthusiasts will have no choice but to buy a device in the One lineup. Sense 3.0 got raked over the coals for being sluggish and bogging down the OS, so it was a matter of natural curiosity for us to see how the upgrade performed. The user interface itself still offers much of the same experience, so we weren't expecting Sense to perform much better as a result. To our surprise, 3.6 fared noticeably better than its predecessor. This gives us cause to wonder if this had more to do with the ICS framework than HTC's own tweaks. Either way, we ran a few benchmarks on the same Sensation XE before and after the update, and the results are actually quite interesting. We saw huge performance increases in the browser and graphics, though other processes were mixed: Quadrant Standard scores were consistently higher, but Linpack results suffered greatly. Overall, the majority of benchmarks we ran suggest Sense 3.6 is in far better shape than the previous firmware, but we still can't help but wonder if it would be even more improved if it ran something similar to 4.0 (read: lighter and simpler) instead. Certainly, the design changes didn't stop there -- there are several microscopically tiny adjustments scattered throughout Sense 3.6, but most of them won't ensure that your experience with the new UI will be any better than its predecessors. Still, there were a few nuggets that caught our eye. Camera: Few, if any, tweaks were made to the camera on our Sensation XE, but we're not certain that the user interface will look identical across HTC's entire lineup (with adjustments for devices with different types of cameras, for example). No easter eggs: Nothing happened when we repeatedly tapped the Android version number, which likely means HTC has disabled the stock ICS Nyancat easter egg. We have a hard time believing that anyone's crying over the loss, especially since 3.0 didn't offer any such buried surprises either. Scenes still show 3.0 screenshots: When you browse through the different Scene options, take a closer look at the actual screenshots. They were brought over from 3.0, with the same ugly three-button launch bar we're so happy to shed. Don't worry, changing Scenes won't revert you back to the old style. 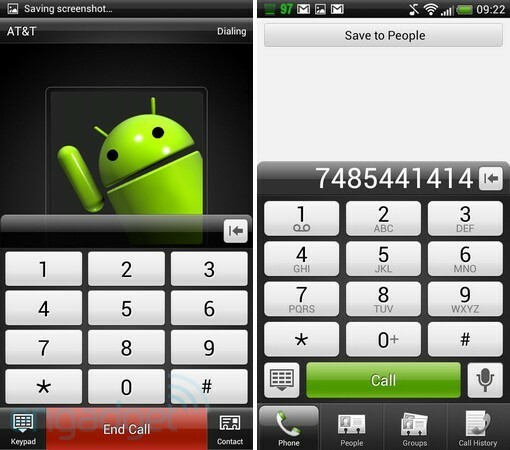 Screenshots: All of the screenshots you see in this preview were taken by simply holding down the volume down button and power / screen lock button, as on stock ICS. 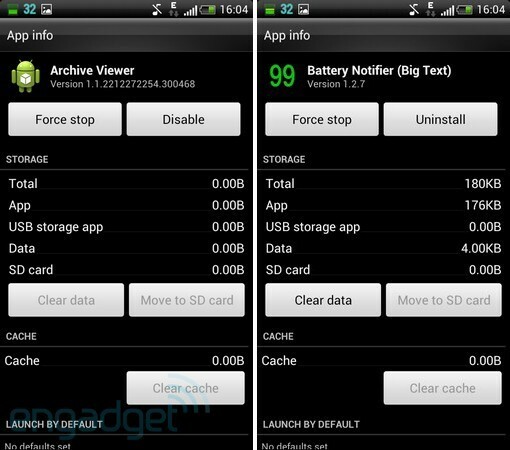 Disabling apps: To our relief, HTC didn't take away the ability to disable apps. We should note, however, that our preview is based on how Sense 3.6 functions on unlocked devices, so we can't be completely certain that carriers won't meddle with this functionality to suit their own bloatware. HTC's legacy Sense UI performs better with Ice Cream Sandwich added to the mix, but the user experience as a whole has changed very little. The company has done this on purpose to satisfy users that were accustomed to the way Sense looks and feels, but if you weren't a fan before, Sense 3.6 isn't going to magically change your mind. What it does do, though, is convince us that even the heaviest Android skins will benefit from Matias Duarte's good graces. As to when it actually shows up on a device near you, well, that's a completely different story.